Nothing like a little junking therapy once and a while. My trip up to the DC area to visit my BFF Beth was a ton of fun. We hit some estate sales and then the BIG FLEA on Saturday. 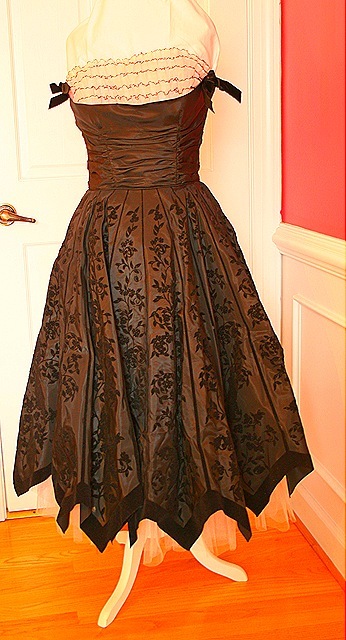 I found a fabulous vintage prom dress, but I can't seem to get a decent photo of it to save my life. Since no one has asked me to the prom, after a gentle wash I will put her on eBay. The BIG FLEA was a bit underwhelming this time, only one building and just a lot of the same old, same old. All my purchases fit into one tote bag with room to spare. Mostly jewelry. A lot of it came from the one dollar table, boy that was a feeding frenzy. 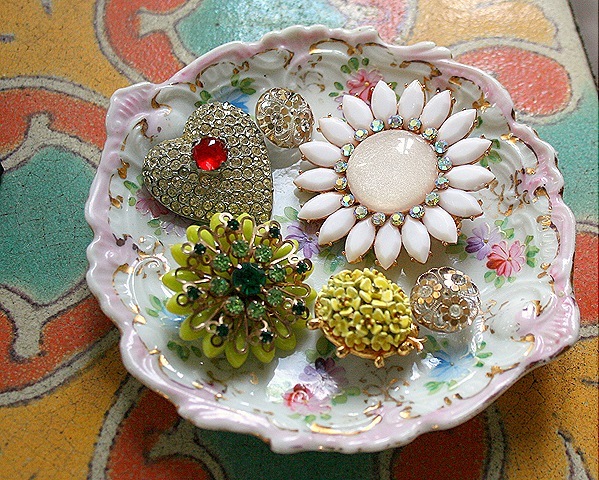 These are the special pieces, I love the big daisy and that heart! Now stop over to Mod Podge Rocks. Amy is having her first giveaway, Mod Podge of course! Also, peruse all the great projects that have been done with Mod Podge, I'm loving the ceiling fan that is on there right now. What a beautiful dress! I was not invited to the San Francisco Ball, in fact I did not even receive an invitation, but if I was I would want to wear that dress. Love the dress!! Is it handmade or is there a size tag? Sooo pretty! Love the jewelry too! I am jealous!! Fabulous frock! 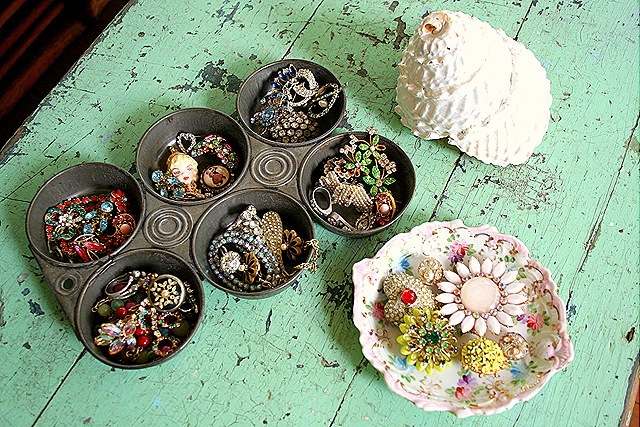 And the vintage baubles are beautiful, too. I can’t believe it. I have a picture of my mother wearing that exact same dress, circa 1950 or so, when it was new. I put it on my blog last year–it’s the entry for January 26th, 2008 (notice that’s last year, not this year). I have another unblogged picture of her sitting in the dress that shows the bottom of it–it’s the EXACT same dress! Can’t believe it! Let me know if you would like two vintage pictures of someone wearing that dress in the early 50’s–may help you sell it on ebay! I keep missing the Big Flea! The only time I’ve been was a year ago,and at that time, it was only one building too. It was still pretty good, though. I wish we had something similar around here! GAH… did you score at that flea sale or what! Sure wish I still lived in Columbia, Maryland… was sooo much closer to D.C. Loved that area. Thank you so much for posting my giveaway – I don’t think I ever thanked you properly. I love your blog! !